As for creatures, I would cut Abysmal Specter, Alley Grifters, Angel of Despair, Balustrade Spy, Confessor, Cunning Advisor, and Hollowsage. 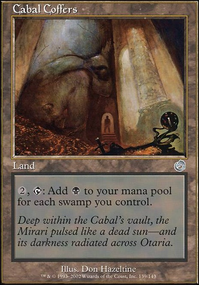 They're all about as valuable as Hill Giant , since your opponents will never agree to let you get the card advantage you're looking for, since the life is meaningless in EDH. That or they'll be outclassed by the time they hit the board. Angel is just too low impact for its cost. You should be positioning yourself to win the game with 7-drops. There are a lot of good options for creatures that make opponents discard. Just off the top of my head, Blazing Specter and Liliana's Specter beat the specters you've included. Here's a Scryfall search I set up for creatures that have discard in the text. All of the instants are bad. 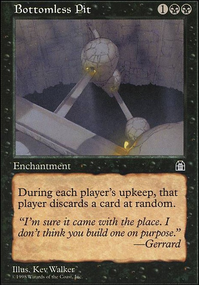 They're mostly low-impact cards that make sense in 1-on-1, 20-life formats, but aren't worth a card in EDH. As for sorceries, Deception and all Mind Rot variants aren't good enough for the format. That means Purge the Profane and Stupor, as well. Doomfall doesn't discard, so it's not good here. Liliana's Spoils is just too inefficient. Mind Knives just puts the two opponents you aren't targeting ahead of both the target and you. As for enchantments, Ajani's Welcome and Impact Tremors need to go. 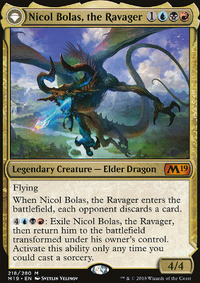 I kind of see what you're doing with the lifegain subtheme, but there aren't really any payoffs in the deck, and a few life just doesn't matter in a format where people win by putting 100 power on the board in one turn or infinitely combo'ing off is the norm. I recommend checking out the page for Tariel at EDHREC. Also the page for discard. Good luck! Specters are pretty lackluster (except for Liliana's Specter with flicker shenanigans). I think it'd be better to go goodstuff with demons etc. For the discard you'll have spells that affect all opponents, like Syphon Mind, Unnerve, Tasigur's Cruelty, Mindslicer, Cabal Conditioning and Myojin of Night's Reach. Better than puny overcosted flyers that only affect one opponent each time. 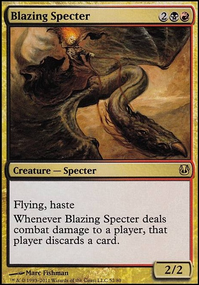 If you really want the specter effect you can just run Larceny. 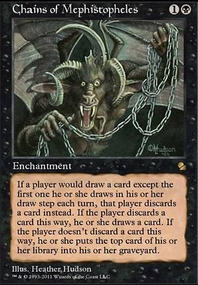 I run a black/blue discard deck, Nebuchadnezzar is the commander. 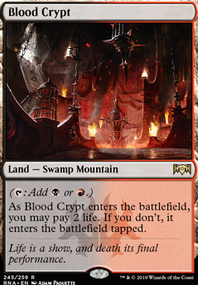 I recommend cards like Oppression and Bottomless Pit. Even though they hurt you, they are too powerful to pass up in my opinion. 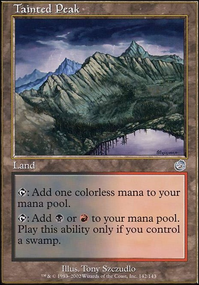 In essence they will be top decking a lot faster with those enchantments on the field. I also run in my discard deck, Reanimate, Necromancy, and Animate Dead as a way to steal other players powerful creatures that they ended up discarding. Sepulchral Primordial is also a wonderful big guy to run in a discard deck. He is pretty powerful by himself but he steals multiple creatures for you. You also should consider the most powerful discard card in the game, Mind Twist. I also run its weaker version too, Mind Shatter. Also Liliana's Specter is pretty nice, 3 mana causes all your opponents to discard one card. I recommend checking out my Nebuchadnezzar deck for my ideas, discard and graveyard decks are my favorite stuff. Overall, your deck looks like a lot of fun and I hope you cause mayhem in your games.